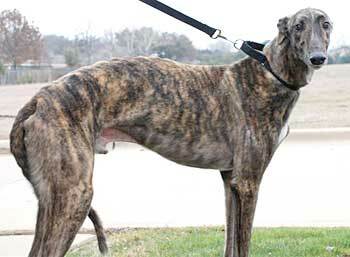 River, aka River Ace, is a 3½-year-old dark brindle male, born September 11, 2003. River was found as a stray by the Ft. Worth Animal Control. His sire is the late Gable Dodge and his dam is River Crystal, making his grand sire Molotov. River's racing career took place all in Texas at the Corpus Christi track, starting November 15, 2005, and ending September 20, 2006. His whereabouts since then are not known. River arrived 15 pounds below his racing weight and with Ehrlichia. He was successfully treated for the Ehrlichia, and will need to be periodically monitored for the rest of his life. River is small dog and cat tolerant as he is fostered in a home with both. Tall, dark, handsome. Very impressive. 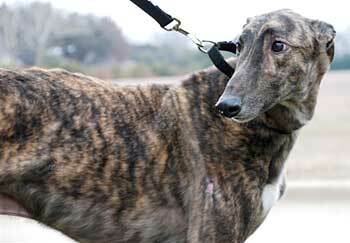 River is quite the hunk - a gorgeous gold and brown brindle with a white blaze and white feet. He is even the perfect height for stroking without having to lean over. In just a few days in his regular (no longer Injured Reserve) foster home, River has adjusted to new toys, beds, feeding times, humans, cats, greyhounds, and routines. He enjoys treats and is learning to sit on command. River is a gentleman when eating, preferring to be methodical rather than inhaling his food. 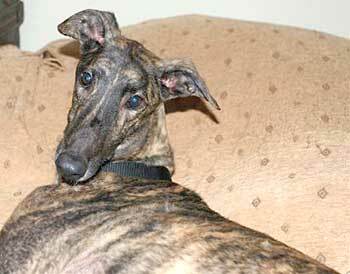 He is the leader of the pack, and the other greyhounds (both female) do not bother him. Sometimes when out in the yard, he has shown off his gorgeous long stride by bounding across the grass. River loves his long early morning walks, retiring to the cool tile entryway when he returns. River is a wonderful combination of happy enthusiasm and sweet, gentle, and loving. There is no question that he is a show stopper when je is out walking (he does walk well on a lead). His human companions will definitely have to get accustomed to being invisible or to walking with a "trophy" dog. River is very "enthusiastic" about the ducks he encounters on our walks, and even more so with close-up squirrels. He can be redirected, however. He is learning to wait patiently for his lead before our walks. He is really making quick progress in learning to be a good house dog citizen.